Comcast did good today admitting billing error and correcting it. Thank you for your comment. It was helpful to me. Comcast overcharged me by $99.95 and when I called to dispute it, they issued a credit because Comcast could not find a reason to support the charge. However, the representative said that I have to pay my bill in full and expect a credit in the following month. I refused and the Agent said late fees would apply for any unpaid balance. I asked for a supervisor. The supervisor clarified that I should only be responsible for the new balance after the adjustments and gave me information on how to log-in online and review my current bill after midnight of the adjustments. I am happy to know that Comcast was willing to accept their errors and to work with me showing the company values my business and wants to keep my service. I scheduled my move a month in advance and did everything their representative told me to do. So much for that approach. They failed to install what was needed at the time of my move and could do nothing to fix their mistake after over a dozen phone calls and more emails than I should admit. A week later I am still waiting for the necessary installation. They actually tried to call me back on my house line --VOIP-- which of course could not work without their service. They promise you to look into it but no one can actually do anything. I emailed corporate head quarters and they are very nice--but useless. Nothing every happened to fix the problem. 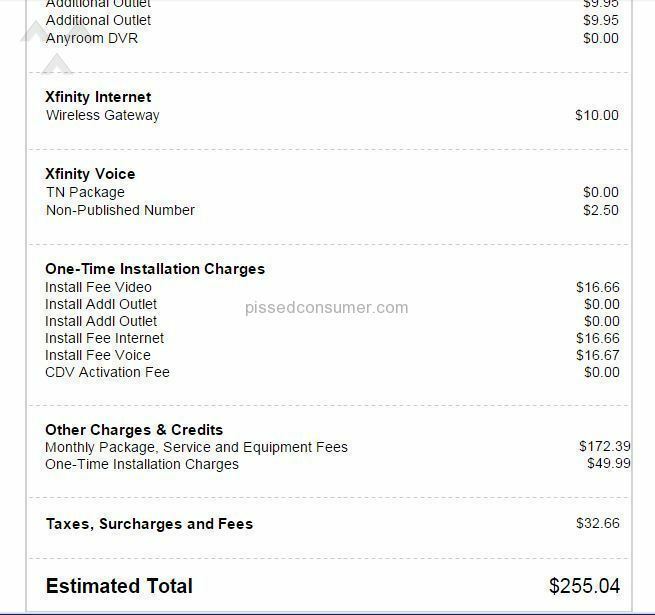 I discontinued service with comcast over a year ago and over paid on my last bill (because they bill in advance) $166.00, I called and talked to at least 9 different customer service people over the last year and they all keep telling me it takes 4 to 6 weeks to get a refund. 14 months later still no refund.I also recently moved to a new apt. and comcast was the provider for it, so I had no choice but to use them again. Right off the bat they started lying again, saying they needed to charge a 100 install fee because there was never service at that address, I happen to know the previous renter and he had comcast. They are either the most dishonest company in the world or the most poorly run. I personally think it is both. I was informed by one of the agents that on demand was where you go and catch up on movies that you missed I was trying to watch a movie and is charging me $16. 99 you guys are a total rip-off the service is horrible your workers are always apologizing you want your money Faithfully but your service is unfaithful. Tv service is bad, all glitchy cant see screen, cant make out pic. Internet goes out all the time. Overpriced, plus installation tech put a hole in our wall trying to install t.v., here over four hours and started to run thick black wire over our book case through the hallway, such an eyesore. Comcast the worst tv and internet company around. Switched to at&t. Hope they are better! I posted a similar occurrence, we are not the only ones. I'm ready to take legal action against Comcast Xfinity. First off, my employer pays for my internet access. Seven months ago Comcast came to my house for a service call. This time they decided to bill me for $99 yet never sent me a bill or contacted me in any way. Fast forward 3 months and they terminate my service because this bill has not been paid. I contact our service rep and was informed I needed to clear up the overdue charge before service could be restored. I call another number, eat the now inflated overdue cost, only to be told they still will not turn my service back on. I was told by an account representative that due to how long the bill went without being paid that he would have to basically create a new account based on my old one. I'm told that I have to sign a digital contract to tie the old and new account together. I then recontact our service rep and inform them what has been done per her instructions only to be told that I was told incorrect information. She says she will cancel the other contract and reactivate my old one. Now I am getting double billed and they have turned off my service again. My employer is paying their half, but I'm still getting billed for the contract that was supposedly canceled. When I contacted our service rep about this situation again I am told that she will try to get my service turned back on but I will have to probably pay for the last three months even though this is something that should have been taken care of on their end. Misled, lied to, and double billed. If I could get out of this I would. The worth phone customer service COMCAST had. I've been transfer different departments, also two of them hang up my call. I am a new customer just sign with them, this is kind joke. First when the installation guys come, they just told me they cannot installed cable, BECAUSE the place I live do not have wire connected. after two weeks waiting period. One guy came put the wire on everything work just ok. Then I start to have problem with their billing services. I've been told, i have to pay this that ... total $250 something. Nobody trying to tell me why or how the bill that high, but hang up my phone..
Internet has been down for over a week. we scheduled service calls 3 times. No show, no call. Service is still down but they told me 5 times it was fixed or would be fixed.